Browse: Home / 2018 / November / 25 / REIT Report: More MOB buys in HCP’s future? So far, 2018 has been quite a busy year for Irvine, Calif.-based HCP Inc. (NYSE: HCP), a longtime health care focused real estate investment trust (REIT) that has been taking significant steps to reconfigure its portfolio. 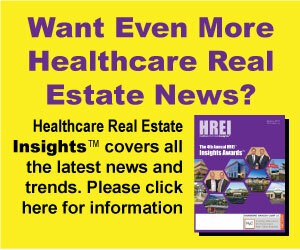 While the REIT’s overall portfolio was long dominated by senior housing facilities, much of its activity over the last couple of years has been geared toward rebalancing its portfolio to be equally comprised of medical office buildings (MOBs), life science facilities and senior housing. In working towards that goal, the REIT has been bolstering its life science holdings through acquisitions and new developments while reducing its senior housing holdings, including spinning off its HCR Manor Care skilled nursing portfolio in 2016, selling its RIDEA II portfolio of senior housing facilities that it owned in a partnership with Brentwood, Tenn.- based Brookdale Senior Living (NYSE: BKD), disposing of numerous other assets operated by Brookdale, exiting its senior housing investments in the United Kingdom (U.K.), and other activities. At the same time, the REIT says it is focused on bolstering its medical office building (MOB) holdings, meaning it could be in the market to make more acquisitions in the future. HCP made quite a few headlines in early August when it announced that it was acquiring, in a joint venture (JV) partnership with New York-based Morgan Stanley Real Estate Investing (MSREI), 16 MOBs in and around Greenville, S.C., from Scottsdale, Ariz.-based Healthcare Trust of America (NYSE: HTA) for $285 million. At the time of the announcement, HCP said the JV planned to dispose of three of the MOBs that it acquired in the deal. In forming the $605 million JV partnership with MSREI – its second with the company — HCP, which owns 51 percent of the JV, contributed nine MOBs with an overall occupancy of 80 percent and valued at $320 million. MSREI, which owns 49 percent of the JV, contributed equity to make the Greenville purchase. Disclaimer: The author has no financial positions in the companies mentioned and the article does not constitute an investment recommendation.